Gutter writing gets the full treatment. 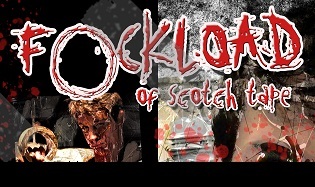 When Out of the Gutter 5 hit the shelves in early '09, its "30 Minute Read" feature was a brutal, moody piece by writing prodigy Jedediah Ayres, called "Fuckload of Scotch Tape." The story was noticed by a Chicago-based indie filmmaker named Julian Grant and a process was begun that has recently culminated in the release of a feature length film and a graphic novel. Bursting with visual energy, [Fuckload of Scotch Tape] bombards its audience with music video and comic book aesthetics ... surveillance footage, split screens with multiple temporalities, digital mimicry of celluloid home movies, and many other styles. Most films, as with the popular Paranormal Activity franchise, only replicate one type of media by copying the look of home-video footage uploaded onto You Tube. The more ambitious works, like FLOST, blend many different conventions to arrive at an exciting new visual aesthetic for cinema. Grant’s film also speaks to our ability to quickly access the archives of film history. FLOST is a conscious homage to film noir, the greatest of all genres in American cinema. Benji the beleaguered anti-hero is a nastier version of the great male-leads of noir history— Joe Gillis from Sunset Blvd, Walter Neff from Double Indemnity, and Jeff from Out of the Past come to mind. Like those characters, Benji obsessively provides voice-over for the double crossings, duplicitous females, and the dark psychology and fatalistic outcome of his story. FLOST is a brutal, hallucinatory glimpse into the depths of a criminal underworld most will never experience first hand. Julian Grant's visually stunning re-imagining of Jedidiah Ayres bleakly hilarious stories accompanied by Kevin Quain's haunting score made FLOST one of the most entertaining and unique viewing experiences I've encountered in a long, long time. And as if the completion and release of a full length flick isn't enough, Mr. Grant has come out with a limited edition graphic novel as well. Both of these brilliant and surprising adaptations of a brilliant and surprising story are available for reviewers, festival organizers, readers and watchers, and all the information can be obtained by clicking through to Julian Grant's site right now! (And you can also order the original story in its raw, Gutter incarnation by clicking here).